Benjamin Franklin was a Founding Father of U.S. who had a significant and profound influence in the early development of his nation. He was a prodigious inventor and his numerous inventions include the lightning rod, bifocals, long arm and the Franklin stove. Franklin held several prominent posts during his career and was instrumental in getting French assistance during the American Revolution. He was in the Committee of Five that drafted the U.S. Declaration of Independence. Franklin was also among the leading writers of his time and is famous for his Poor Richard’s Almanack. Know about the versatile contributions of Benjamin Franklin though his 10 major accomplishments and achievements. #1 He created the first published political cartoon in U.S. In October 1729, Franklin, along with Hugh Meredith, bought the newspaper The Pennsylvania Gazette. He not only published the paper but also wrote pieces for it under aliases. 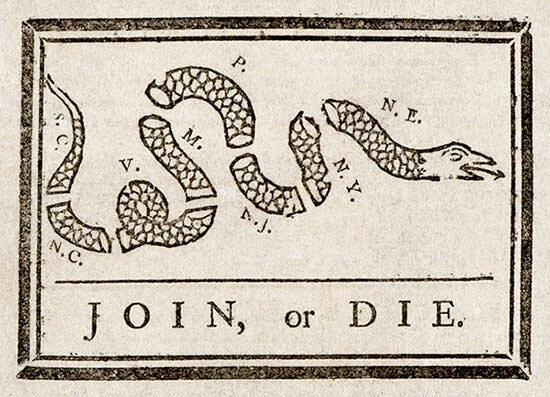 Join, or Die, the first political cartoon in America, which was created by Franklin, was published in the newspaper on May 9, 1754. The cartoon later became a symbol of colonial unity during the American Revolution and remains popular. The Pennsylvania Gazette became one of the most prominent newspapers in U.S. and remained so till around 1800. 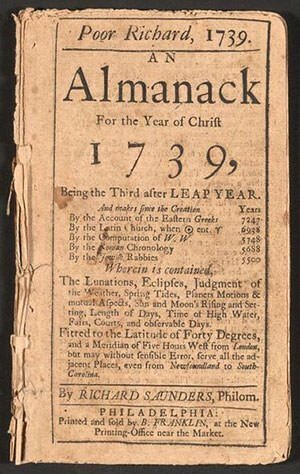 In December 1732, Benjamin Franklin first published his famous Poor Richard’s Almanack. 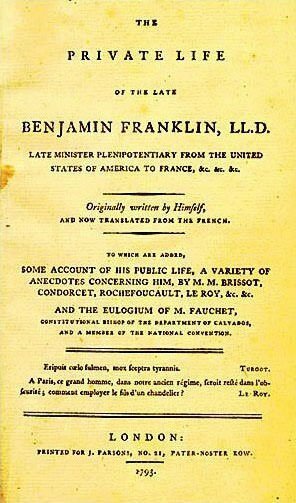 The almanac, which was published yearly for 25 years till 1758, brought Franklin both fame and economic success. It sold as many as 10,000 copies a year, was considered significant by Napoleon Bonaparte to translate it into Italian and was the first work of English literature to be translated into Slovene. Though it was known that Franklin was the author, he used the pseudonym Richard Saunders. The character was poor but claimed to be a philomath and astrologer. Some of the phrases coined in the almanac have become common quotations in the modern world like “A penny saved is twopence dear”. Franklin conducted thorough investigations on electricity. He challenged the then believe that electricity consisted of two opposing forces; proposed that it moved from one body to another; coined several terms including positive, negative, battery, charge and conductor; proposed that lightning was indeed electricity; and was the first to discover the principle of conservation of charge. His experiments enabled him to create a device that would protect buildings from the destructive force of lightning. 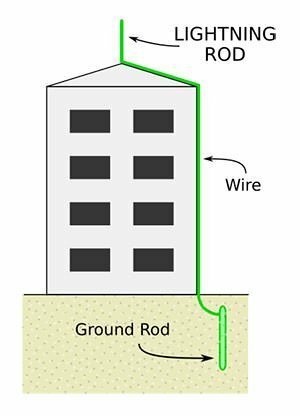 Thus the lightning rod, which protects structures by earthing, was invented. Franklin suffered from presbyopia due to which he required two sets of glasses. This led him to invent bifocals, which are eyeglasses with the upper half for distance and lower for reading. Franklin’s bifocal design has remained mostly unchanged till modern times. 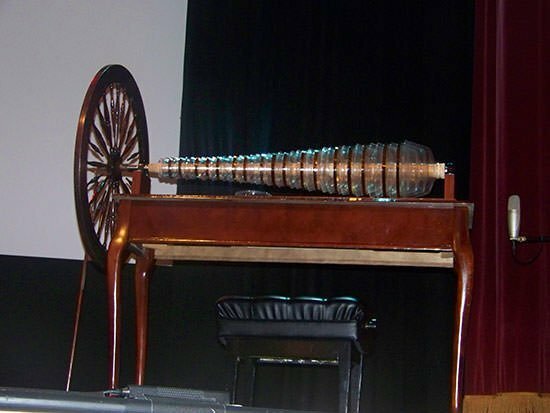 Apart from lightning rod and bifocals, Franklin invented swim fins; the musical instrument glass armonica; flexible urinary catheter; his own version of the odometer, which is an instrument to measure the distance traveled by a wheeled vehicle; the long arm, which is used to reach books in high shelves; and the Franklin Stove, which is a device to provide more heat and less smoke than an ordinary fireplace. In 1757, Franklin went to England to represent the Pennsylvania Assembly as a diplomat in its fight against the descendants of the Penn family over who should represent the Colony. Later he also became a representative of Massachusetts, Georgia and New Jersey. In 1765, the Parliament of Britain passed the Stamp Act which imposed a direct tax on its colonies in British America. There was widespread opposition against the Act in America. Franklin led the American cause in the Parliament in London and in March, 1766, the Stamp Act was repealed. Due to this Franklin emerged as the leading spokesman for American interests in England. The American Revolution had begun by the time Franklin returned to America from Europe in 1775. Benjamin Franklin was unanimously elected by the Pennsylvania Assembly as their delegate to the Second Continental Congress, which was a convention of representatives from the Thirteen Colonies to manage their war efforts against Britain. It decided to issue a declaration of independence and Franklin was one of the five members who were appointed to draft it. 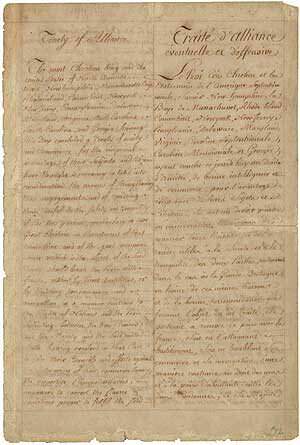 Though much of it is written by Thomas Jefferson, Franklin made several important changes. The U.S. 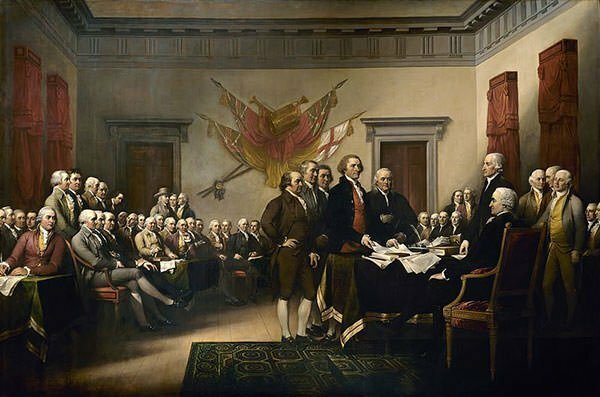 Declaration of Independence, announcing that the colonies regarded themselves as independent sovereign states, was adopted on July 4, 1776. In December 1776, Franklin was sent to France as the first U.S. Ambassador. He played a prominent role in the development of positive relations between America and France. French assistance was instrumental in the victory of American colonies over Great Britain in the Revolutionary War. Franklin was one of the representatives from U.S. who signed the Treaty of Paris in 1783, which among other things brought the war to an end and made Britain acknowledge U.S. colonies as free, sovereign and independent states. In fact, Franklin is the only Founding Father who is a signatory of all four major documents of the founding of U.S.: the Declaration of Independence, the Treaty of Alliance with France, the Treaty of Paris and the United States Constitution. Franklin was appointed postmaster of Philadelphia by the British Crown Post in 1737, a post he held on to till 1753. His effective measures led to the first profits for the colonial post office. 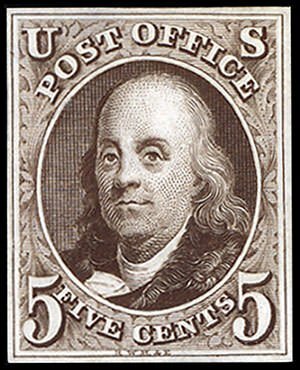 In 1775, when the Second Continental Congress established the United States Post Office, Franklin was made its postmaster general due to his experience in the field. The postal system that was established continues to this day, though it was transformed to United States Postal Service in 1971. Franklin was the primary founder of the University of Pennsylvania. Established in 1740, Penn is today ranked among the top research universities in the world. Franklin was also one of the founders of American Philosophical Society and was elected its first president. Founded in 1743, APS remains an eminent scholarly organization of international reputation. In independent America, Franklin served as the sixth Governor of Pennsylvania from 1785 to 1788. In 1751, Franklin wrote a short essay titled Observations Concerning the Increase of Mankind, Peopling of Countries, etc. in which he examined population growth, its dependence on food supplies and its limits. This is considered one of the leading works of eighteenth century demography or population studies. Franklin wrote about his life and this unfinished record was published after his death, which occurred in 1790. Known as The Autobiography of Benjamin Franklin, it has long stood as one of the most famous and influential works in the genre. this help me with my social. Lota, Let us add some humor into this… Let’s say not so appealing topic, well at least to me. No offense, Franklin Lovers. Hopefully you understand. And yes, Jaden and Aj, chips really are good. Have a beautiful day~! And am known throughout the Internet as eFrog. really this is for important stuff. I think this website is helpful because it gives you a lot of really good information. I can’t use this because I’ve already used it all. Gahh! Amazing information. Thanks for the help! It really gave me a boost, I’m all caught up! Really helpful. Great job. Helping many around the world, just like me! Have a blessed, great, beautiful day/evening/night~! Thanks Ariana. Happy to help.